Can you hear your furnace turning OFF and ON a lot? That’s called short cycling, and it will hurt your furnace and raise your monthly energy bill if you don’t fix what’s causing the problem. Let’s go into more detail about each of these reasons and how to fix them. If your air filter looks like the one on the right, it’s time to change it. The first (and most common) cause of short cycling furnace is a dirty air filter. A dirty filter restricts air from reaching your furnace’s heat exchanger, which causes your furnace to overheat and then shut down. Eventually it will turn back on and the process will repeat itself. Solution: Change your air filter if it’s dirty, and then be sure to check your filters every 30–60 days and replace them as needed. If you need help, refer to this DIY guide on changing home air filters. If your thermostat is located near a heat source (like a heat register), it will feel the heat and turn off the furnace, only to quickly realize the room is actually cool and turn the heat back on. This is short cycling. A thermostat needs to be near an area that better reflects the average temperature of your home. A corroded or dirty flame sensor will cause your furnace to short cycle. A flame sensor’s purpose is tolet the system know if there’s a flame when the gas valve is open. If there is no flame, the flame sensor will shut off the gas valve to prevent gas from entering your home. However, if the flame sensor is dirty or corroded, it won’t register the flame and will just turn off the gas valve, which will shut your system down. A blocked exhaust vent (also called a flue pipe) can also cause short cycling. If debris like sticks, leaves or an animal’s nest is blocking the pipe, hot gases will build up in the furnace and cause it to overheat. When your furnace overheats, automatic safety features will kick in and shut down your furnace for safety. 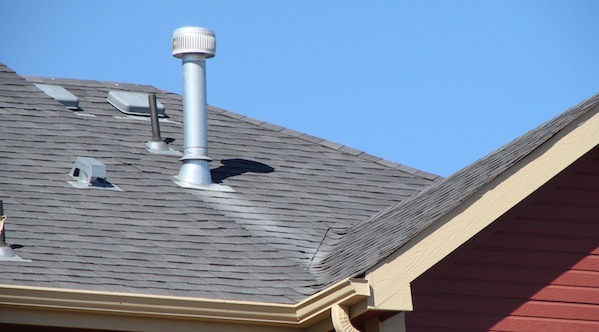 Solution: Furnace exhaust vents are usually found on the roof (as pictured above) or on the side of your home near your furnace. If you can locate the vent, you can try shining a light in it to see if there’s anything blocking airflow. Make sure to shut off your furnace before you check the exhaust vents so you don’t breathe in any poisonous gases. If you’re not sure where to find your furnace exhaust vents, or you find something obstructing your vents, call a professional for help. This is the most expensive short cycling problem to fix because it means you’ll need to replace your furnace. When it comes to your home’s heating and cooling system, bigger isn’t better. You see, an oversized furnace will heat your home too quickly, causing it to shut off once it reaches your set temperature. Then your home will cool off and your furnace will repeat the cycle: heat your home and then quickly shut off. This “start-stop” process is what causes your furnace to short cycle, which harms your furnace and wastes a lot of energy. Solution: You’ll want to contact a certified heating expert to perform a Manual J Heat Load calculation for your home. This calculation will determine what size your furnace should be. This calculation takes into account many factors like the size, shape, insulation and local climate of your home to determine the right furnace size. Learn more about furnace sizing: What Size Furnace Do I Need? Want to stop the short cycling? Contact Santa Fe Air to schedule a furnace repair today. We’ve been fixing furnaces in the Kansas City metro area since 1987. Why Is My Furnace Running Constantly? A Kansas City Tech Explains.